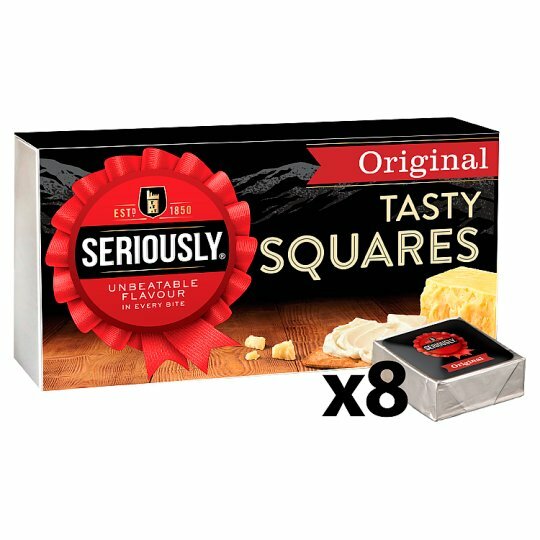 Seriously® Spreadable Squares are so irresistibly scrumptious because they are made with award-winning Seriously® Cheddar that gives them such a rich and tangy taste. Each little Square is individually foil-wrapped to lock in all of the flavour and creaminess, also making them ideal to enjoy anytime, anywhere! Spread them onto crusty bread, wrap or bagel for a tasty lunch. Our Seriously® Spreadable Squares are the perfect addition to any picnic or lunchbox occasion. These little Squares are so irresistibly scrumptious because they are made with award-winning Extra Mature Scottish Cheddar that gives them such a rich and tangy taste. Spread them on crackers, sandwiches or crusty bread for a seriously delicious lunch. Keep refrigerated., Best before: See front of pack.